In stock -This product will ship today if ordered within the next 7 hours and 6 minutes. Remove dirt & cleanse with a creamy milk that foams to bubbles. 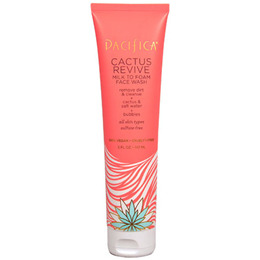 Cactus Revive Milk to Foam Face Wash is an innovative milk to foam wash, by Pacifica, which gets perfectly bubbly to help lift dirt and debris to the surface. This is a go-to in your skin`s age fighting arsenal. Plus, it smells amazing. Great for combination skin, especially for those in need of hydration. 100% vegan. Cruelty-free. Formulated without animal ingredients, petroleum, parabens and phthalates. Aqua, myristic acid, cocamidopropyl hydroxysultaine, potassium hydroxide, palmitic acid, glycerin, glycol distearate, cocoyl methyl glucamide, opuntia ficus-indica seed oil (cactus), sodium chloride (salt), sodium methyl cocoyl taurate, benzyl alcohol, sorbic acid, sodium phytate (corn), ethylhexylglycerin, tocopherol (vitamin E), phenoxyethanol, cocos nucifera (coconut) fruit extract, sodium benzoate, parfum (natural), sodium hyaluronate. Can be used morning and night. Apply to damp skin in an upward circular motion. Then rinse. Below are reviews of Pacifica Cactus Revive Milk to Foam Face Wash - 147ml by bodykind customers. If you have tried this product we'd love to hear what you think so please leave a review. Remove dirt & cleanse with a creamy milk that foams to bubbles. Cactus Revive Milk to Foam Face Wash is an innovative milk to foam wash, by Pacifica, which gets perfectly bubbly to help lift dirt and debris to the surface.